MATRIC is very pleased to have Mr. Michael Hale on our staff. Mike is a scientific glassblower with extensive experience in designing and constructing specialized glass articles for laboratory and pilot plant facilities. 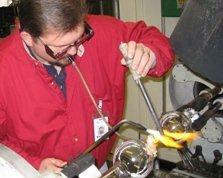 His scientific glassblowing operation is located at the West Virginia Regional Technology Park and includes a glass lathe, glass saw, annealing oven, multiple torches, and other equipment. Mr. Hale is supporting MATRIC projects, but he is also available to assist other organizations that may need scientific glassblowing capabilities. Mike is able to offer a full range of glassblowing services, from simple repairs to complex designs and large glass assemblies. 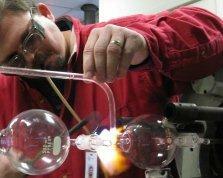 He can replicate or repair any design used for scientific purposes at a very reasonable cost. For our customers’ convenience, we can accept company credit cards such as Visa, MasterCard, American Express and Discover. For information or a quote on your scientific glassblowing job, contact Duane Dombek, Ph.D.
A full range of glassblowing services is available, from simple repairs to construction of complex experimental apparatus.